During her multibook investigation into understand human nature, Gretchen Rubin realized that by asking the seemingly dry question "How do I respond to expectations?" we gain explosive self-knowledge. She discovered that based on their answer, people fit into Four Tendencies: Upholders, Questioners, Obligers, and Rebels. Our Tendency shapes every aspect of our behavior, so using this framework allows us to make better decisions, meet deadlines, suffer less stress, and engage more effectively. I didn't realize it at the time, but when I walked through the door of the Atlantic Grill restaurant one blustery winter afternoon, I was heading to one of the most significant conversations of my life. As I bit into my cheeseburger and my friend picked at her salad, she made a comment that would occupy my mind for years. In an offhand way, she mentioned, "I want to get myself in the habit of running, but I can't, and it really bothers me." Then she added, in a crucial observation, "When I was on the high school track team, I never missed track practice, so why can't I go running now?" "Well, you know, it's so hard to make time for ourselves." We started talking about other things, but even after we'd said good-­bye, I couldn't stop thinking about our exchange. She was the same person she'd been in high school, and she was aiming to do the same activity. She'd been able to go running in the past, but not now. Why? Was it her age, her motivation, her family situation, the location, team spirit, or something else? She assumed that we all have trouble "making time for ourselves." But actually I don't have any trouble making time for myself. How were she and I different from each other? I would spend the next few years trying to answer these questions. They say there are two kinds of people in the world: those who divide the world into two kinds of people, and those who don't. I'm definitely the first kind. My great interest is human nature, and I constantly search for patterns to identify what we do and why we do it. I've spent years studying happiness and habits, and it has become obvious to me that there's no magic, one-­size-­fits-­all answer for building a happier, healthier, more productive life. Different strategies work for different people—­in fact, what works for one person may be the very opposite of what works for someone else. Some people are morning people; some are night people. Some do better when they abstain from a strong temptation; others, when they indulge in moderation. Some people love simplicity; some thrive in abundance. And not only that. As I pondered my friend's observation about her running habit, I sensed that deep below the "night people vs. morning people" sorts of differences, there existed some kind of bedrock distinction that shaped people's natures—­something profound, but also bold and obvious—­that nevertheless eluded my vision. To help figure out what I was missing, I posed a number of questions to readers of my website, including: "How do you feel about New Year's resolutions?" "Do you observe traffic regulations—­why or why not?" "Would you ever sign up to take a class for fun?" As readers' responses poured in, I saw that distinct patterns were threaded through the various answers. It was almost weird—­as though groups of people had agreed to answer from the same script. 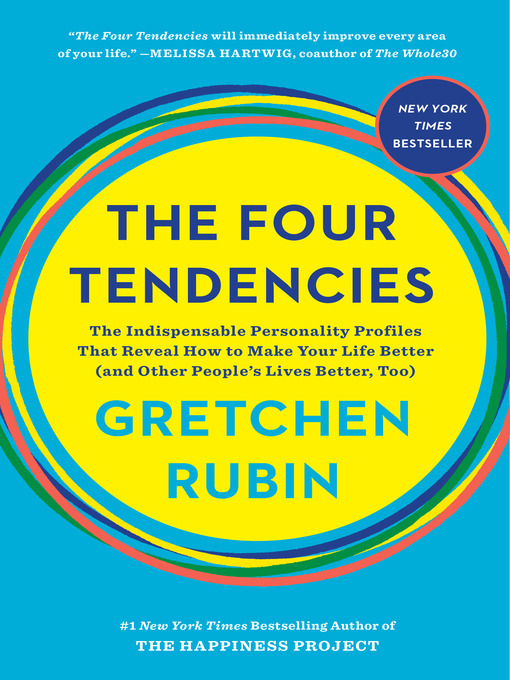 Rubin (The Happiness Project) sorts personalities into four “tendencies”—upholders, questioners, obligers, and rebels—according to people’s motivations for undertaking actions in this breezy but unconvincing work of pop psychology. Each tendency gets two separate chapters devoted to understanding and dealing with people with a specific trait. There’s even a Venn diagram and brief, if arbitrary, quiz. The simplicity of the profiles is comforting, but the science is questionable. The author commissioned a survey and uses anecdotal evidence to bolster the framework’s worth, but her attempts to find proof smack of confirmation bias. The author diagnoses her friends and social-media followers using her framework, sometimes sounding wise, at other times smug. Supposedly there’s no hierarchy to the tendencies, but the author, an upholder, can’t quite hide her preference for her own tendency, with her husband’s questioner tendency running a near second. 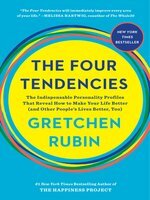 Even the author admits that personality frameworks can’t “capture human nature in all of its depth and variety,” but nevertheless argues for utilizing her ideas to improve one’s life. In its best moments, the book reminds readers that not everyone approaches the world from the same perspective. Agent: Christy Fletcher, Fletcher and Co.
An exploration of human behavior patterns as viewed through the lens of four specific tendencies.With data garnered from more than 600,000 participants in her online quiz, bestselling self-help author Rubin (Better Than Before: Mastering the Habits of Our Everyday Lives, 2015, etc.) contends that when individuals were asked the question, "how do I respond to expectations?" their responses aligned within four tendencies: upholders, questioners, obligers, and rebels. Upholders desire knowing what should be done and respond well to both outer expectations and inner expectations. Questioners question both outer and inner expectations and avidly seek out justifications before meeting an expectation. Obligers desire accountability and respond more readily to outer expectations but struggle to meet inner expectations. Rebels, who desire the freedom to do things their own way and on their own schedule, tend to resist all expectations. The author, a self-proclaimed Upholder, lays out plausible examples within sections devoted to each tendency, with consideration given to relationships, workplace dynamics, and family. She offers the lofty assurance, "with wisdom, experience, and self-knowledge from the Four Tendencies, we can use our time more productively, make better decisions, suffer less stress, get healthier, and engage more effectively with other people." Rubin's study provides some interesting food for thought, and readers may find relatable examples from their own lives. Yet her analysis lacks psychological or scientific grounding, and it can lead to questionable conclusions--for instance, her assertion that these tendencies are hard-wired: "They don't change depending on whether we're at home, at work, with friends. And they don't change as we age." Furthermore, the author fails to provide adequate attention to socio-economic influences; the quotes and case examples all seem to come from middle-class white Americans, primarily women. A sometimes-thought-provoking but ultimately insubstantial assessment of human behavior. For devoted followers of this popular author.